When the 2CV first appeared, it surprised the world by being a car stripped to basics in the extreme, by being out of fashion with its added-on headlights, and by its low price. 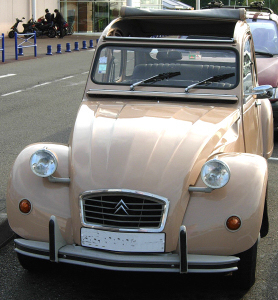 (In 1948 - 1950, the price of the 2CV was about US$650, about half that of a Volkswagen beetle.) 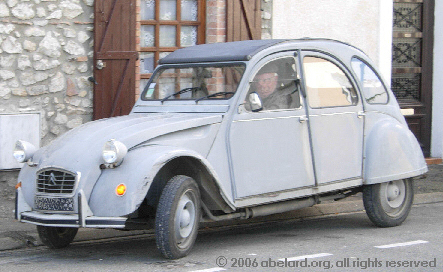 Only the Citroën name stopped the car from being thought a joke. But the 2CV had a surprising career. 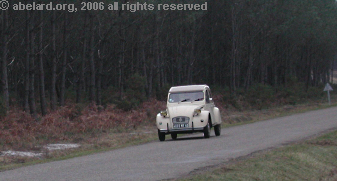 It received popular approval in the rural world for the go-everywhere suspension, was adored by the low earners for its unbeatable price, and loved by everbody for what it represented: a car beyond time, beyond fashion, and which knew every variation - from a 2CV 4 by 4 to the price Citroën 2cv 1948 CV cross-country car - and all the adaptations of its motor made by 2CV lovers: from tractor to pump, from buggy to motorbike. Today, this ageless little rustic car has been loved by its millions of owners. The 2CV is a true symbol and historic monument of French motoring that draws generations of supporters, with more than 300 clubs worldwide and rallies. Now 2CVs can be seen buzzing around French towns and countryside, some beautifully restored and maintained, others dented and dull from hard use. See impecunious young people touring around France, stopping by the roadside for picnics, the car complete with camping equipment on board. Or meet a farmer, bumbling along, on his way to check his maize crops with their giant irrigation systems, or off to the local farmer’s suppliers for a spare part. Down at the local supermarket, a 2CV proudly renovated will disgorge a family to go for their week’s shopping. The pater familias will even show off the well-thumbed parts manual, the new bible for 2CV lovers, while the family waits long sufferingly in a car that’s now as ‘good as new’. The deuche represents France for all of an epoch. Made for forty-two years, the 2CV had been sold all over the world with a production total of more than 5 million examples. 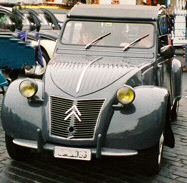 The 2CV became as ubiquitous in France as the Ford Model T had been previously in the United States. The first colour was a single choice - grey - to simplify and speed production. There were also two-coloured 2CVs - the Charleston - in yellow and black, crimson and black, grey and black. the duck : from the Ugly Duckling , a Hans Andersen fairy story. Before World War II, Citroën had a logo with a beautiful swan on it representing the floating motor (Le Moteur Flottant). At the 1948 Paris Car Show, the 2CV was likened to being an ugly duckling amongst the other handsome Citroën swans on show. Another version is that the beautiful Citroën swans had given birth to the 2CV ugly duckling. This nckname appears in many languages. When Michelin the famous tyre maker bought out Citroën in 1935, the Michelin brothers - founders of the family business - had the idea of creating an economical car for the peasants and others with small incomes. They asked Pierre Boulanger, the new boss of Citroën, to make a market study to sound the expectations of future clients regarding such a car project. Following this study, Boulanger wrote the specification which would be so close to the heart of the largest pre-war French car maker. 3-speed gear box. In fact, there is also a supercharger position, which acts as a fourth gear. To transform this dream into reality, Boulanger had the services of André Lefebvre as engineer, and Flaminio Bertoni, whose nickname was gold fingers, as stylist. This team gave birth to one of the most iconic cars of the 20th century. Pre-war prototypes from Lefebvre formed a car in thin and undulating sheet metal, with a water-cooled 375cc two-cylinder engine and suspension that allowed interaction between front and back wheels. It used expensive materials like magnesium to reduce weight. Tests were made in a top secret centre at La Ferté-Vidame, west of Paris. By May 1939, 250 examples of the newly named “Type A”, were collected in the Levallois-Perret factory to be available for the Paris car show in October 1939. But the intervention of war decided otherwise. On the outbreak of war, almost all of the “Types A” prototypes already assembled were dismantled. 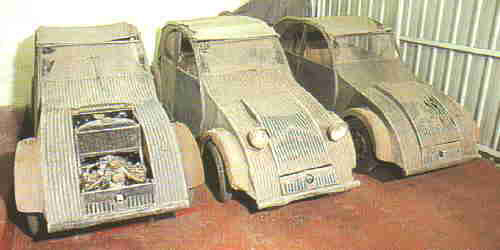 Of the cars remaining, three were hidden at La Ferté-Vidame in the lofts of the test centre, while another was hidden in the basement of the study offices of Citroën in rue d’Opéra, Paris. During the war, the Nazis, who were up to date with the study of the TPV, asked Pierre Boulanger to make available the plans of the TPV in exchange for him seeing Hitler’s plans concerning the German car that would become the “Volkswagen”, the people’s car. The boss of Citroën remained firm and never divulged the plans. 1938 : about twenty different permutations of prototype being tested. 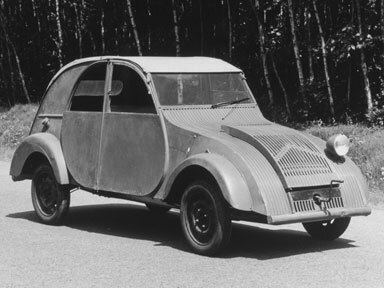 3 September 1939 : the first TPV was shown to the public. War was declared and the TPV construction line was requisitioned. Almost all assembled cars were dismantled. 1942 : Numerous modifications were made to the car, notably changing from a single headlight, which had given the car a nickname of Cyclops. Note the ovoid style of the doors. 1948 : A type of grass-cutter was abandoned and its battery and electric starter are put in the now air-cooled car, presented at the Paris car show, the 35th Salon d'Automobile. June 1949 : 2CVA manufacture started. Four vehicles a day were made, and the demand was so great that the delivery delay was more than 18 months. 1950 : production of 400 cars a day. 1988 : end of production of the 2CV in France. 27 July 1990 at 16h00, the last 2CV left Mangualde factory in Portugal. The name deux chevaux - two horses - refers to the taxation classification of the car, not to its physical engine power. 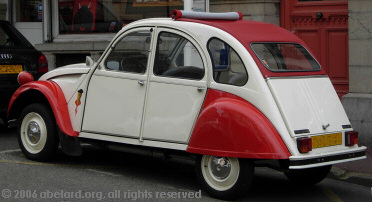 By 1968, the 2CV had a 602 cc engine (giving 28 bhp/20.5 kWatt 7000 rpm). Officially, this classed the cars at 3CV, but the car’s commercial name remained 2CV; except in Brazil, which did call these cars 3CV. In fact, the original 1948 2CV could generate 9hp power at 3500 rpm.